I have been living in Israel for a year and a half and have taken two trips back to the States. On my first trip, I brought a long list of things to buy to bring back to Israel. On the second trip, the list of things to bring back was brief and non-descript. I realized that by living in Israel I was becoming less interested in material things, getting used to a lifestyle of living with less, and arriving at a place philosophically where I truly felt that less is more. 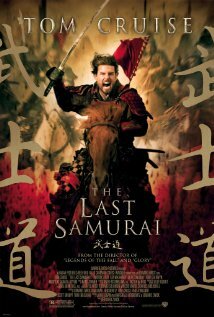 This way of life is celebrated in the rousing and violent adventure The Last Samurai, which depicts in a symbolic sense the struggle between modernity and tradition. Tom Cruise is Nathan Algren, a Union soldier in the post Civil War period, who is haunted by the ghosts of his past indiscriminate killings. He is recruited by the Japanese government to help quash a Samurai insurrection that threatens the economic well being of the New Japan, which is promoting increased trade and dialogue with the West. Algren accepts the job, but in an early and bloody confrontation with the Samurai he is captured and brought to their mountain village. There, Katsumoto, the leader of the Samurai, engages him intellectually and emotionally. In this remote and picturesque setting, Algren soon finds himself enamored by the simple lifestyle of the Samurai, who live by a rich code of ethics supported by close ties of friendship and family. Hallmarks of the Samurai way of life are self-discipline, devotion to a set of moral principles, and striving for perfection in whatever they do. Algren senses the spirituality of the Samurai and learns how to focus his mind so that he feels “life in every breath.” In many ways, the Samurai values echo the Jewish notions of living by a higher law and striving for spiritual perfection. Before the climactic battle scene, there is a scene of prayer suggesting that success in battle depends on one’s spiritual state. This is very much a Jewish sensibility. In these heightened moments of awareness right before battle, when life is so precarious, there is thoughtfulness about what really matters in life. Tradition is paramount. Katsumoto articulates this in a dialogue with the financial entrepreneurs who want to remove the archaic Samurai from the contemporary political landscape. The money men see them as a relic of the past, preventing Japan from entering the modern industrial age. Katsumoto tells them that the Samurai cannot forget who they are or where they come from. For him the sacred traditions animate and give meaning to the present. When Algren, at the movie’s denouement, informs the young emperor of Japan of Katsumoto’s death, the young monarch wants to know how he died. Algren perceptively and wisely responds: “I will tell you how he lived.” His answer reminded me of the Jewish imperative to live by the commandments and not die by them. Following the eternal principles and traditions of the Torah gives meaning to one’s daily existence, imbuing each day with a sense of transcendent purpose. Both the Samurai and the Jew understand that although life can be filled with peaks and valleys, with joy and pain, leading a life of the spirit can give meaning to the entirety of one’s journey on earth. The film closes with speculation that Algren returns to the Samurai mountain village where he first met Katsumoto to begin a new life of spiritual integrity. He has discovered that progress is not always a good thing and that, spiritually speaking, less is often more.